Letter from Jaffe to Lankes discussing the framing of a gifted painting and Lankes possible relocation from Virginia to New York, as well as mention of Mrs. [Mary Sinton] Leitch's report on trying to find Lankes a position at Norfolk William and Mary. Jaffe, Louis I. 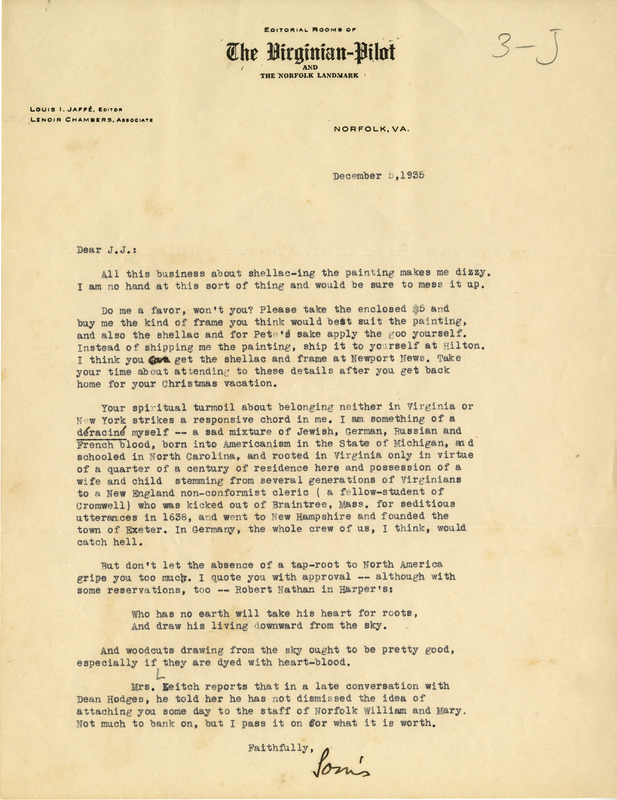 (Louis Isaac), 1888-1950, “Letter, Louis Jaffe to J. J. Lankes, December 5, 1935 (Ms2019-014),” VT Special Collections Online, accessed April 23, 2019, http://digitalsc.lib.vt.edu/Ms2019_014_JaffeLankes_/Ms2019_014_JaffeLankes_B1F1_JaffetoLankes_1935_1209.